Gavin McDonnell squares up to Jorge Sanchez, watched by Dave Colwell. Gavin McDonnell continues his education on the biggest stage in world boxing, this weekend. 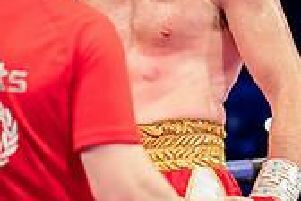 The Doncaster super bantam takes on Nicaraguan Robin Zamora on the Kell Brook v Gennady Golvkin undercard at London’s 02 Arena. Trainer Dave Coldwell says: “Gavin is desperate to see how good he can be and needs to be facing top opposition. He’s adapted well since joining me 18 months ago and everything I’ve asked of him he’s listened to. We’ve had some good wins and those victories have helped him climb the ladder in the rankings and he sits in a good position at the moment and we want to build on that. “There are some good names in the ratings at super-bantamweight but Gavin has nothing to fear. He’s learning every single day in my gym and the bonus of having other world class fighters in there is pushing him. He’s watched his brother, Jamie, confirm himself as one of the best bantamweights in the world and he was there when Tony Bellew won the world title in May and he wants to feel what that is like.